Nearly one month has already passed in 2014, which seems quite difficult to believe. We hope that you will continue to check in our blog this year as well. 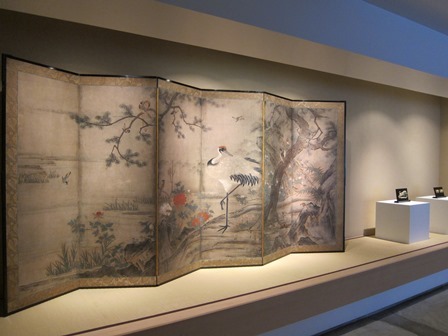 Please allow us to introduce our New Year exhibition in Shirokane, featuring a beautiful Muromachi period birds and flowers screen welcoming visitors at the entrance. An elegant crane stands prominently just off center of this subdued, yet colorful composition. 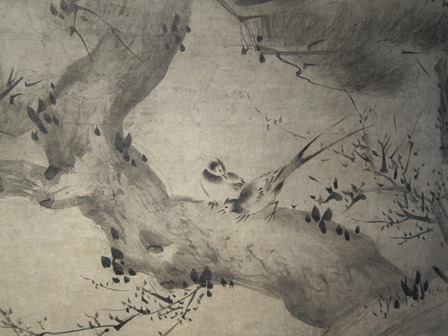 In this scroll by Kano Motonobu (1476 - 1559) a number of small birds flit about a rugged old pine. It is almost as if you can hear them singing. 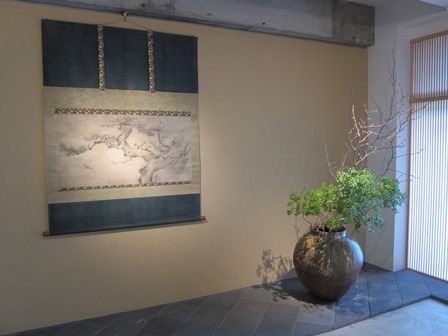 Though the cold continues day by day, we hope that you will take the time to come by and see the show.